Six years after the violent death of her husband, Amelia is at a loss. She struggles to discipline her ‘out of control’ 6-year-old, Samuel, a son she finds impossible to love. Samuel’s dreams are plagued by a sinister monster he believes is coming to kill them both. 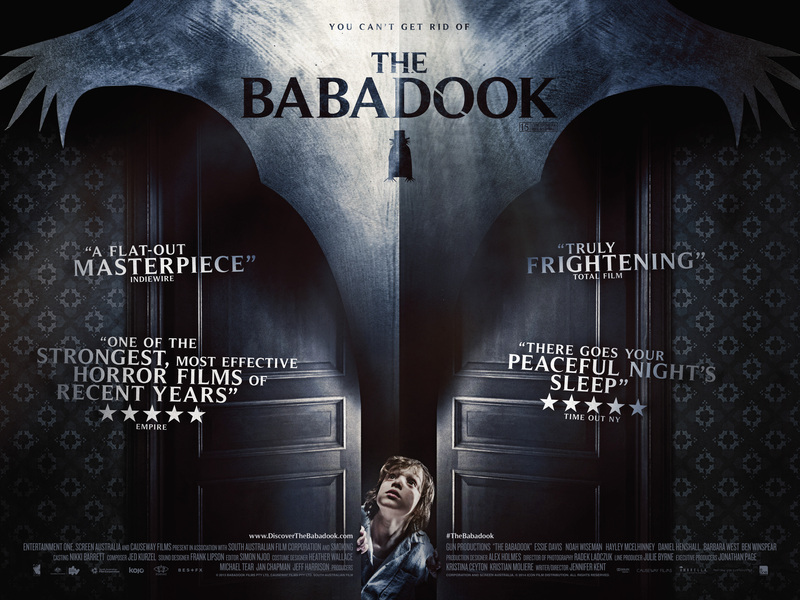 When a disturbing storybook called ‘The Babadook’ turns up at their house, Samuel is convinced that the Babadook is the creature he’s been dreaming about. His hallucinations spiral out of control and as he becomes more unpredictable and violent, Amelia is genuinely frightened by her son’s behaviour. But when Amelia begins to see glimpses of a sinister presence all around her, it slowly dawns on her that the thing Samuel has been warning her about may be real. “The Babadook” just won the Best Horror Feature, Best Screenplay, Best Actor, and Best Actress Awards at the 2014 Fantastic Fest. Be sure to catch this terrifying psychological thriller when it hits theaters November 28th! Direct TV subscribers will have a chance to catch the film in their house on Halloween! *Movie Review will be posted closer to release date. For those of you who prefer to make Halloween a “scary movie night,” deciding on what to watch can be a difficult. However, I have narrowed down a few choices that are equally entertaining. Though this film is fairly new, The Guest is an inevitable cult classic and it features a quite memorable Anna Peterson, the teenage daughter that seems to be the only one in her family that has suspicions about their recent house guest, David. Once she discovers the unsettling truth about David, she admirably overlooks his blazing baby-blues and irresistible charm so that she may take matters into her own hands and protect her family. 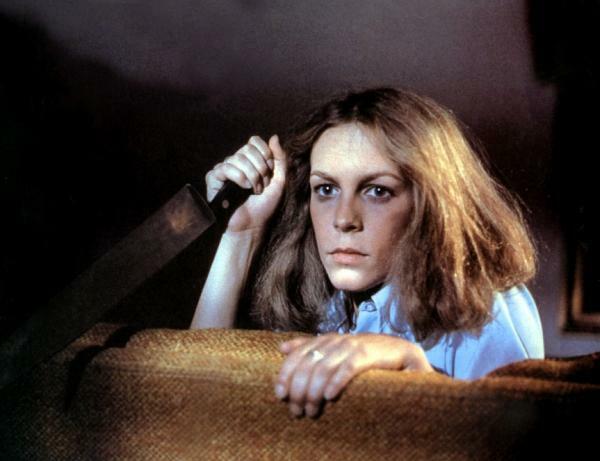 Laurie Strode is considered by many to be the first true horror heroine. She is a regular “girl next door” who fights off her psychotic murderous brother, Michael Myers, time and time again. Although she struggles with her own war against Michael, helping children in danger is her first priority before her own safety. Nancy battled it out with Wes Craven’s monster masterpiece, Freddy Krueger, a burnt serial killer who uses a glove armed with razors to kill his victims in their dreams. Being the only one of her friends that was able to stay awake, Nancy drove Freddy into a realm where he could be defeated. In the course of four films, Sidney is terrorized by various killers who claim the Ghostface mask. Each time these murderers make his or her way into Sidney’s life, it’s a guilty reminder of what started this crime wave to begin with. Having your mother’s infidelity be the reason why your own boyfriend turned into a psychotic killer is a traumatic experience all in itself. But, Sidney is forced to relieve this horror through copycat killers and a cheesy, mimicking, Hollywood slasher with infinite sequels. Suffice it to say, there’s no escaping this never ending nightmare. And sadly, repeatedly getting betrayed by the people you trust most and continuously making it out alive earns this heroine our top spot! Looking to find an authentic, blood-curdling good fright for Halloween, five friends set off on a road trip in an RV to track down these underground Haunts. Just when their search seems to reach a dead end, strange and disturbing things start happening and it becomes clear that the Haunt has come to them. Since Remember the Titans, there has yet to be a movie based on a real football team or player that is able to emotionally grab and thoroughly entertain an audience. It’s a hard feat to accomplish, given that most of these true stories have an enriching plot but struggle to successfully translate their message. Unfortunately, 23 Blast has fallen victim to this formula. Based on the true story of Travis Freeman (Mark Hapka), a high school football star, who is suddenly stricken with irreversible total blindness. Travis quickly assumes his life is over and begins to spend his days at home sulking. 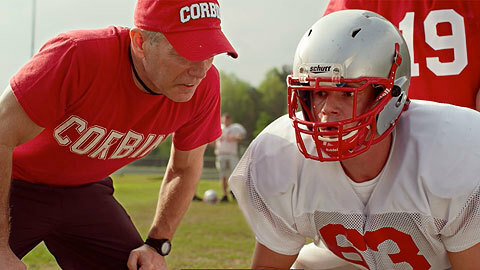 Until one day, his former football coach (Stephen Lang) discovers a way to utilize the team’s key player. This premise is undoubtedly uplifting. The thought that a blind student could still play football and have the support of his team and town is incredibly moving. But, when you choose to tell this story with a weak supporting cast, an unnecessary, forced love story, and an amateur screenplay, it will distract from your inspiring tale. Though it’s not the best film to put on a resume, 23 Blast does feature a few stand out performances, beginning with their lead, Mark Hapka. Known for his long running role in Days of Our Lives, Hapka proves that he can take on the big screen and has more to offer than dramatic stares. He commits to his character and portrays a genuine personality that’s easy to like. As for Bram Hoover, who plays Travis’ best friend and also co-wrote the script. His first tackle at the big screen was an upsetting fumble. The lack of development and cliché dialogue did no favors for the fairly, new actor. Hoover’s attempt to shine as the supporting star was intercepted by Glee’s Max Adler, who starts as the film’s antagonist. But like his character on Glee, he’s the bully who turns a new leaf. There is a quality in both, Hapka and Adler that shows true potential for these talents. 23 Blast offers a remarkable story that is trying to stay afloat from its sinking surroundings. 23 Blast hits theaters October 24. 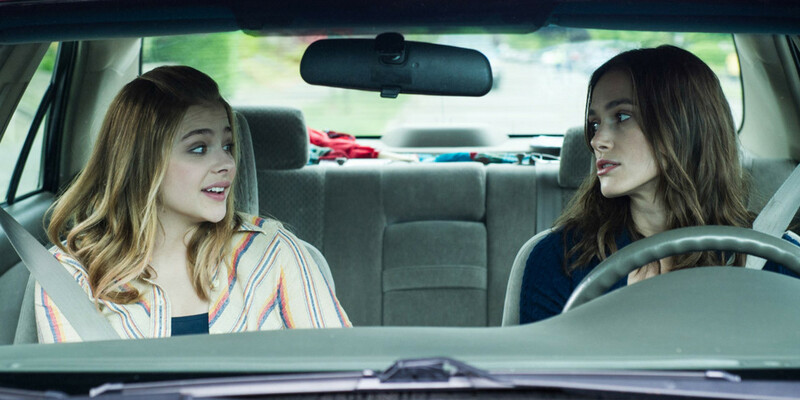 Lynn Shelton, whose unique directorial voice created such astutely observed comedies as YOUR SISTER’S SISTER and HUMPDAY, crafts a sweet, coming-of-age romantic comedy about three people who find their lives intertwined in the most unconventional way. Keira Knightley shines as Megan, a rare female slacker hero who shows us that while you never stop growing up, you can choose stop lagging, and start living on your terms. Rated R for language, some sexual material and teen partying. Lifetime isn’t really known for their “scary movies.” But once in a while, they tend to deliver a film that successfully spooks you while watching. High School Possession, however, is not one of those films. Lauren (Janel Parrish-Pretty Little Liars) and Chloe (Jennifer Stone-Wizards of Waverly Place) are best friends. But recently, Chloe is having trouble and spiraling out of control at home and at school. Her mother has taken her to countless doctors, and none of them can clearly diagnose her. While on assignment for the school newspaper, Lauren interviews Olivia (Shanley Caswell-The Conjuring) and her church youth group known as “The Chosen.” But after the interview, she accidentally sees them performing an exorcism on a girl. Lauren is horrified but intrigued. So she begins to investigate, and it seems to have really helped the girl. Now she wonders if Chloe might be possessed, and the only way to save her is through an exorcism. You would think this film would take advantage of its demonic elements, and go for some attempt at making its audience scream. This is meant to be released on the week of Halloween for a reason right? Well, that’s too bad, because this might have been the lamest Lifetime thriller yet. I have seen scarier and more interesting episodes of Pretty Little Liars. I wasn’t sure if the direction was aiming for teen horror or family friendly. Though High School Possession fails to deliver, the film’s set up of a possible sequel, surprisingly has some potential. High School Possession premieres Saturday, October 25, at 8pm ET /PT on Lifetime. They were known simply as “The Lost Boys.” Orphaned by the brutal Civil war in Sudan that began in 1983, these young victims traveled as many as a thousand miles on foot in search of safety. Fifteen years later, a humanitarian effort would bring 3600 lost boys and girls to America. In “The Good Lie,” director Philippe Falardeau, (“Monsieur Lazhar”) brings the story of their survival and triumph to life. 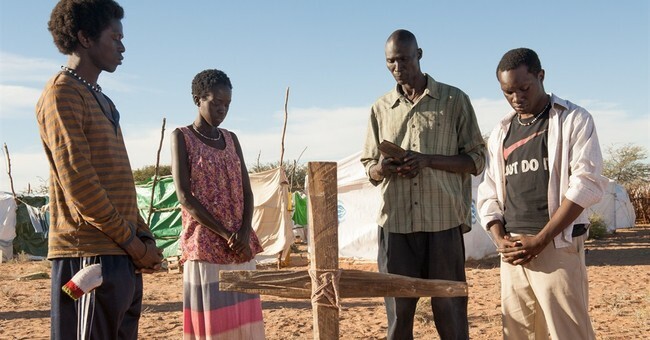 Sudanese actors Arnold Oceng, Ger Duany, Emmanuel Jal, and newcomer Kuoth Weil, many of whom were also children of war, star alongside Academy Award winner Reese Witherspoon and Corey Stoll. 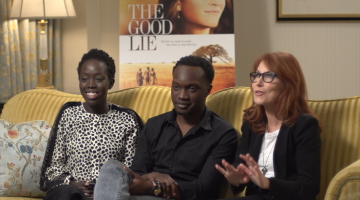 I sat down with The Good Lie writer Margaret Nagle (Red Band Society, Boardwalk Empire) and stars Arnold Oceng and Kuoth Wiel to discuss life changing choices, how we can help the South Sudanese children, and much more. I really did love this film, I wasn’t prepared for how emotionally affected I would be. I do wish I had had some tissue. But I have to say it was so well written, and you two were fantastic in it. So a lot of the characters are faced with some tough choices in this movie. What’s the biggest decision you guys have had to make so far in your life; either career wise or just a life changing decision in general? It’s really rare that a movie can have that effect on the audience. Is there another movie for you guys that after watching it you got inspired to help out for a good cause? There’s also a lot of humor in here, too. One of the funniest parts was when the guys were thanking God for the miracle food that is pizza. I think pizza is amazing as well, but do you guys have a favorite food that you would also say is worthy of that title? The Good Lie opens in theaters October 3.